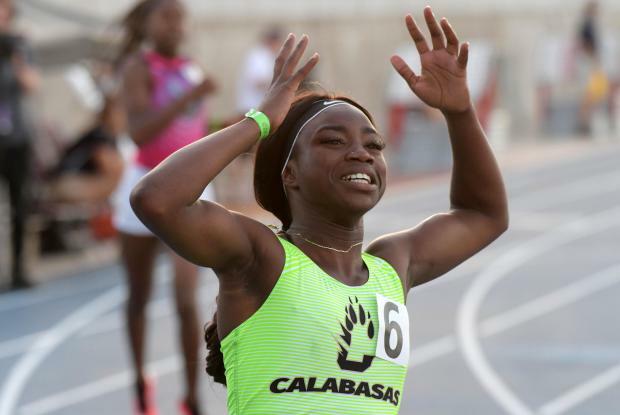 CALABASAS -- The above imagine captures Calabasas High junior De'Anna Nowling in the micro seconds after crossing the finish line with the 100-meter title at the 2018 CIF-State Track Championships. The field Nowling had defeated included defending champion Ariyonna Augustine of Long Beach Poly (now at LSU), her dear friend and longtime sprint rival, Jazmyne Frost (who would lead Gardena Serra to the State team title that day), and the previous fastest girl in the California, Stockdale's Aaliyah Wilson (now at Washington). Nowling's reaction to her stunning victory was a jumble of emotions beyond what was obvious. Within a few more steps she would be down on the track, crouched and crying. "At first I was happy," Nowling said recently, recalling the emotion, "and then I looked over and seen his mom and got on the ground and started crying. Everybody thought it was because I won, but I seen his mom." 'His mom' is a reference to the mother of her brother, who, along with her young sister, was shot and killed in a drive-by shooting in Victorville in 2014. Only by chance is Nowling here today to tell the story. Nowling's story is one of perseverance, talent, heart, quite a bit of dancing, a bright future, and survival. De'Anna was at the house that day, some five years ago. She said she had been with her little sister just moments before but had left her to go inside. In whatever short time Nowling was inside the house, lives were taken outside. "To me, it was a shocker. I was just frozen," she said. "I was frozen for like a couple months." Her brother went by the nickname 'Braze'. He was 21, she said. Nowling remembers him in many ways including by using "lilbraze" as her name on Instagram. Nowling, 17, the youngest of a large and complicated family, says her fallen siblings talk to her in her sleep. De'Anna talks back when she's awake. "It's different every time," she said. "If I'm feeling nervous, 'Man, I'm nervous. Help me out.' Before I walk on the track I talk to God. But when I'm on the track, I talk to my sister and brother. "At the line, if you see me looking up or looking down with my eyes closed, I'm talking to them." Another way Nowling says she honors the memory of her siblings: "I run."